There's a reason for this late review of Locomalito's They Came From Verminest, and it's not because I've been busy. Well, actually I have been busy, but that's not the issue here. The thing is, I was fortunate enough to be involved quite early on with his latest game as a beta tester, and as part of the team who ultimately shaped the final release with Locomalito making careful tweaks to the design based on our feedback, until now I just felt far too attached to the game to be able to review it without being completely biased. After going cold-turkey from this incredibly addictive retro title for the past two weeks, I finally felt ready to return to it with a clear head and fresh perspective - at least that was the plan. But like a former-addict returning to his vice, after a single hit I am completely hooked; I have fallen in love with Verminest all over again. 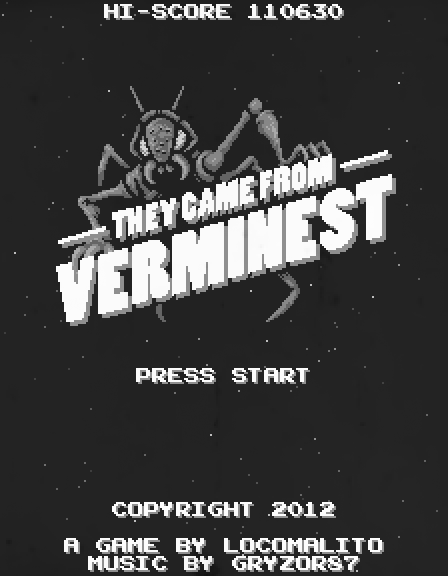 I really should elaborate on the fancy visual modes (which if you like, could be argued to be the unique selling point of Verminest), but I'll come to that later. For now, let me attempt to explain what it is that Locomalito has managed to get so completely right with this game. Those of you who have been following the indie scene for a while may recall the fuss that was made over Guxt, a traditional arcade shoot 'em up with Gameboy-classic aesthetics that received a great deal of deserved acclaim upon release (including by RGCD's own T.M.R, who reviewed it way back in issue two of our discmag). 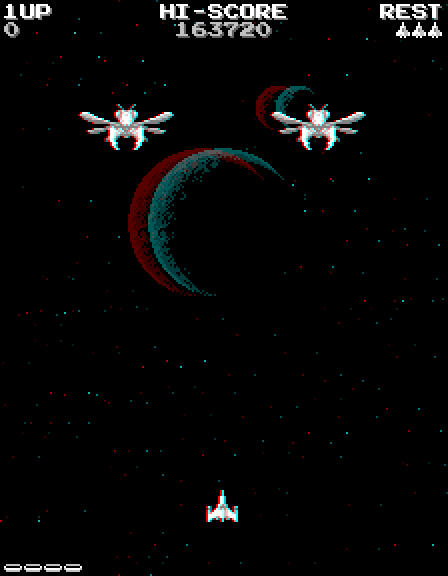 Guxt didn't rewrite the shmup manual - far from it. At a time when everyone else in the indie scene was pushing boundaries, Pixel took us back to first principles and proved the age-old adage "if it isn't broken, don't fix it" to still be relevant. Guxt bought absolutely nothing new to the table; it used established shooter mechanics and yet still succeeded in being ahead of the new school crowd by a wide margin in terms of balance, design, playabilty and challenge. 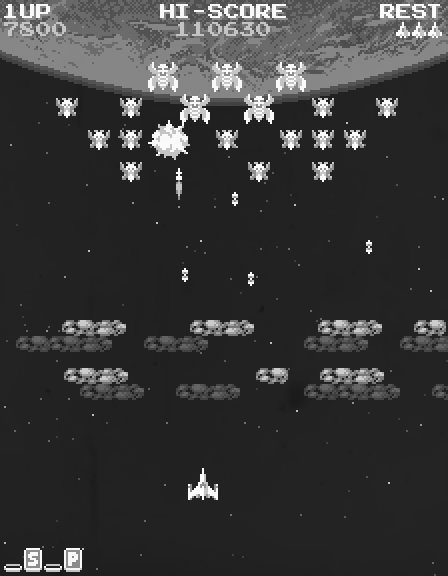 Now in 2012, Locomalito has yet again taken us back, waaaay back, with Verminest - a reinterpretation of Namco's Galaga coin-op - and for me it has been a journey of rediscovery of what it was that attracted me to gaming in the first place; the challenge, the excitement and the suspense of finding out what comes next. 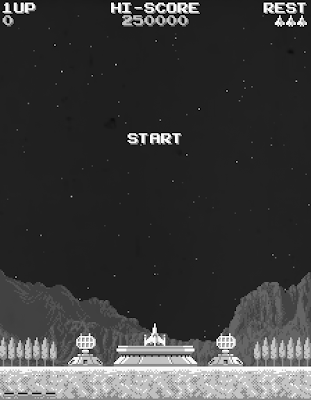 With it's simple yet flawless graphics, authentic retro arcade sound and timeless playability, Locomalito has taken the Galaga concept and made it his own. This is no by-the-numbers port, but rather an epic, multi-headed monster of a conversion that plays homage to several classics simultaneously whilst still maintaining it's identity as the brainchild of an artist who clearly played far too many arcade games as a child. Recall how you often misremember those old games of the 80's through rose-tinted glasses, better than they actually were? Locomalito has similarly made manifest his own recollections into a nostalgic release that is by far greater than the sum of it's parts. Unlike the original game, Verminest throws surprise after surprise at the player upon completion of each attack wave - mini-boss encounters, meteor storms, new enemy types, bonus rounds - on your first play-through it's an exciting edge-of-your-seat experience. 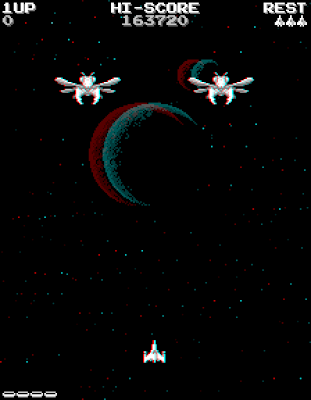 Your quest to destroy the evil space bugs will see you fly from planet to planet, navigate through dense asteroid fields and face gargantuan space-fiends before you finally reach the Verminest homeworld. Without ever being over-ambitious or pretentious, Verminest is a larger-than-life sci-fi adventure of B-movie proportions, which is probably why Locomalitio saw it fitting to include a 1950's drive-in style 3D mode (glasses not included) as well as scratchy film loop effects. 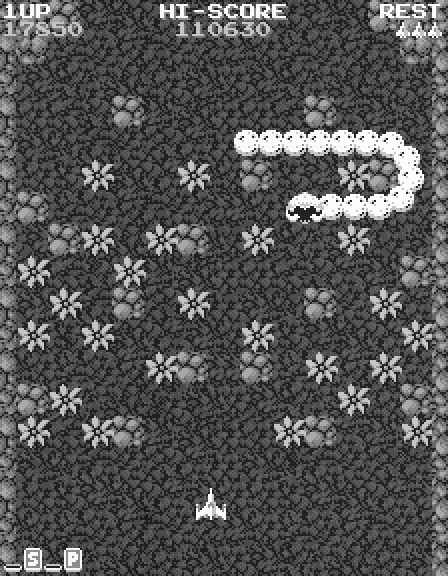 Power-ups and game mechanics are deliberately oldschool. Collected by blasting alien space-eggs, the old favourites armour, power shot, extra bullets and speed are all present and of course act exactly as you'd expect. The scoring system works by way of offering medals for taking risks and sharp shooting; take out an enemy at close range, that's one in the bag. Blast away the leader bugs in the back row of the standard enemy waves, and half of the remaining critters will flee - with a medal awarded for each one! And what do medals mean? Points, lots of them, and ultimately some much-needed extra lives. As for boss battles, well I really don't want to spoil any surprises, but I will say this - they are without doubt the highlight of the game, and are both cleverly designed and perfectly executed, playing like separate minigames and offering variation to the standard wave-based shmup action. It's these encounters that for me are the main draw pulling me back to Verminest time and time again, and much like his other games (especially Hydorah), I'm sure it will continue to hold me within it's giant space-insect claws for some time yet. When you take into consideration that Locomalito actually created Verminest for fun whilst working on a larger project, there's simply no denying this young man's genius. He's a modern day indie hero, and this game is an essential addition to any retro gamer's collection. (Make sure you check out his other excellent releases as well as the wide range of extras offered on the Verminest download page). One of the best shmups I've played for quite a while. This is on par with everything else they've done. That is to say, brilliant. A shameless Galaga rip-off + 50's sci-fi-theme. How cool is that?